With so many amazing sights to see across the country, it’s hard to know what destinations are worth burning rubber to get to. Will that new museum you’ve been hearing about end up being an overcrowded dud? Is that supposedly majestic mountain range outside the city actually more like a hill with a few sad shrubs? 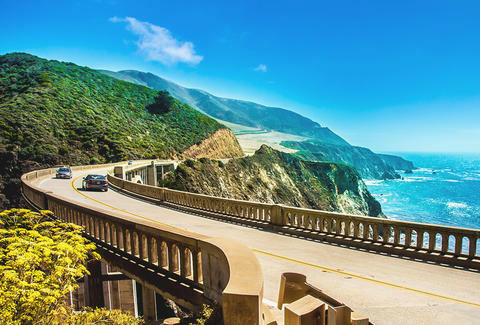 Planning a worthwhile road trip doesn’t have to mean plotting out a multi-day cross-country trek, navigating the Pacific Coast Highway, or driving to the newest trendy city. Plenty of lesser-known places make for a rewarding destination -- if you know where to look. So avoid the tried-and true-tourist traps on your next trip by following our guide, and discover an adorable Maine fishing village, the oldest city in America, and a cozy town that inspired a holiday classic. Happiness may be a journey, not a destination -- but we’re betting these stops will leave you plenty satisfied. While Portland is quickly transforming into a popular foodie destination, just an hour’s drive away, the quaint inlet of Perkins Cove, on the edge of Ogunquit, offers the total Maine experience in a cozy seaside setting. Since no visit to the state would be complete without it, grab a lobster roll at local favorite Lobster Shack, then go one step further and learn the crustacean trade from real fishermen on a lobster boat cruise. 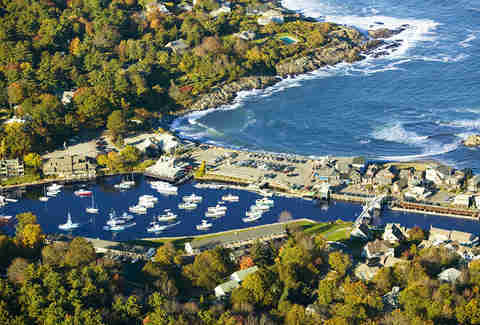 Aside from seafood, visitors can catch a show at the nearby Ogunquit Playhouse (this summer featured Sally Struthers and The Sopranos’ Vincent Pastore in Bullets Over Broadway), stroll on the flower-laden shoreline pathway of the Marginal Way, or browse for art and antiques in the harbor’s shops. Legend has it that the Native American name Ogunquit means “beautiful place by the sea,” and sitting by the water, a fruity blueberry ale and a lobster roll that tastes like the ocean in your hand, you’ll understand why. Seneca Falls, New York, may be most well-known as the site of the first Women’s Rights Convention in 1848, but the hamlet boasts another claim to fame as the supposed inspiration for the 1946 holiday classic It’s a Wonderful Life. Residents have long argued that the film’s Bedford Falls setting bears a striking resemblance to their town, which director Frank Capra was known to visit in the 1940s -- and it has the (free) It’s a Wonderful Life Museum, housing memorabilia from the movie, to prove it. Each year, Seneca Falls also hosts an annual It’s a Wonderful Life Festival the second weekend of December, when its cozy main street is likely to resemble the snowy road that a desperate George Bailey (Jimmy Stewart) ran down. Even if you’re not much of a cinephile, Seneca Falls makes for a great day or overnight trip year-round, though especially in the fall, when you can sample wines at local vineyards and take in some of the most breathtaking foliage the Finger Lakes region has to offer. Located just an hour from the Syracuse and Rochester areas, it’s the perfect spot to experience American (and movie) history while also unwinding in a quaint upstate New York ’burb. Just try watching Gilmore Girls and not end up wanting to step into its quaint, quirky setting of Stars Hollow. 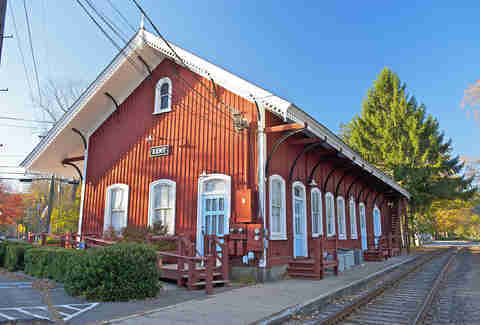 The cozy Connecticut towns of Kent and Washington Depot, which served as creator Amy Sherman-Palladino’s inspiration for the show’s home base, are as close as you can get to the fictional thing. Channel Rory Gilmore and browse for paperbacks at the independent bookstore House of Books and stay at the five-star Mayflower Inn, the real-life version of Lorelai Gilmore’s workplace the Dragonfly Inn (if you feel like splurging). And you don’t even have to be a fan of the TV show to appreciate the picturesque Kent Falls State Park with its 250-ft. waterfall. Located just two-and-a-half hours from New York City, this dose of small-town New England living offers the perfect escape from subway-delay-induced meltdowns. 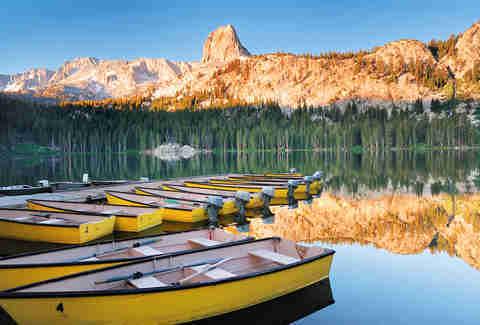 Yosemite and Lake Tahoe may get all the glory, but Mammoth Lakes, California, offers its own gasp-inducing scenery and fresh mountain air for urbanites looking to flee the grind of Los Angeles or San Francisco. Forget selfies -- your eyes will be glued to the scenery, with lakes so clear that you can see your reflection and mountain trails perfect for hiking or skiing. Visit in the summer or fall for barbecue and wine festivals, or cozy up in one of the many nearby ski lodges during snowy months. After lunch in one of the area’s acclaimed restaurants, take a horse or gondola ride to experience the staggering beauty of the Sierra Nevada mountain range up close. If it’s the great outdoors you crave, Mammoth Lakes delivers in spades. 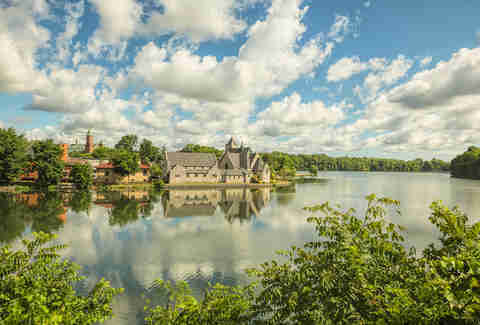 Consider Leiper’s Fork the perfect antidote to the crowded country western bars, overpriced boot shops, and numerous bachelorette parties of Nashville, offering the full Tennessee experience in a relaxing package. Antique nuts especially love the quaint vibe of the town, which is located 28 miles southwest of Nashville and brimming with Southern charm and quirky shops. 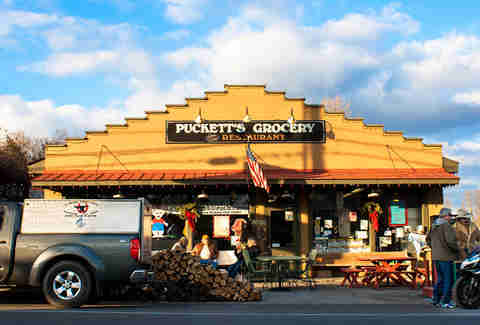 After a day of perusing the European wares at stores such as Serenite Maison, grab a “meat and three” at Puckett’s Grocery, which features live country music most nights of the week. Fans of the small-town antics of the Dukes of Hazzard gang will enjoy the replica General Lee and old-fashioned police car parked in town. You might even catch a glimpse of local celebs such as Nicole Kidman, Justin Timberlake, and Michael “The Beard” McDonald who enjoy the anonymity and slow pace that Leiper’s Fork offers. 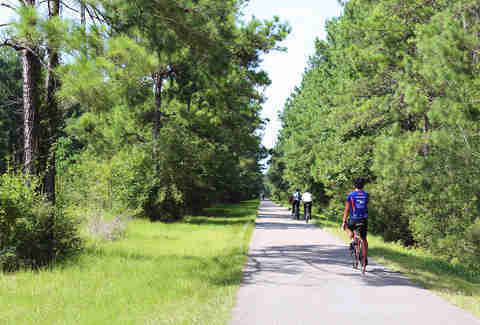 Florida is more than just beaches and retirement communities and weird news stories: the state also boasts the oldest city in America, St. Augustine, just two hours from the Disney theme parks sprawl of Orlando. 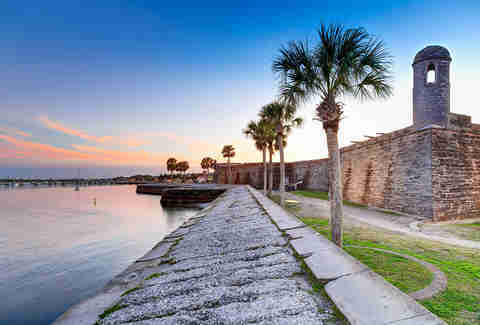 Forget the Magic Kingdom -- St. Augustine’s sights, like the Castillo de San Marcos fortress and the oldest wooden schoolhouse in the US, will give you the joy of traveling back in time. The historic old city is now home to a lively nightlife scene for those seeking some modern entertainment, while thrill seekers can take a ghost tour of some spooky (and supposedly haunted) buildings. And the city’s got gorgeous beaches, to boot. 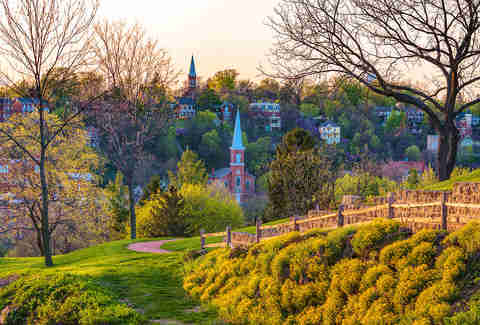 History buffs will love Galena, Illinois, a frozen-in-time ’burb located three hours from Chicago. The onetime home of General Ulysses S. Grant, Galena and its cozy inns, sprawling French Colonial mansions, and cobblestone streets will transport you back to the days of horse-drawn carriages. Grab a drink at the Blaum Bros. Distilling Co., catch a sleight-of-hand show at the P.T. Murphy Magic Theater, browse bookstores and boutiques on Main Street, and tour General Grant’s historic home. In the fall, the town offers colorful rewards for foliage lovers, while bird watchers will want to take a pontoon boat cruise up the Mississippi River. It’s about as close as you can get to time-travel.